Grade S.S. 316, S.S. 304 and S.S.316. 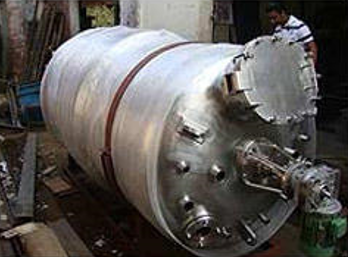 We are engaged in the manufacturing and supplying SS Reactor Vessel in the market. We, Khodiyar Engineering Works were established in the year 2007 as the manufacturer of Storage Tanks & Conveyors. Offered range includes Pressure Vessels, Reactor Vessels and Storage Tanks. Our products are very popular and very much in demand due to high carrying capacity. We have gained expertise in fabricating products meant to be used in refineries and chemical industries. We have always strived and ensured that the fabricated heavy machinery and vessels are flawless and made according to the international quality standards. Our multi-skilled and talented workforce has made us the most trusted and reputed resource for high grade and heavy duty steel vessels. We are a customer oriented company and so we design & fabricate pressure vessels and machinery, according to the clients’ specific requirements and needs. Our quality assurance department ensures that the machinery manufactured goes through a strict quality check at all the stages of the production. Our two big infrastructure facilities at Umbergaon and Thane are well equipped with sophisticated machinery to get the fabrication work done swiftly and easily.